You knew it was going to happen this Winter. Your happy green lawn from last Summer has been assaulted. 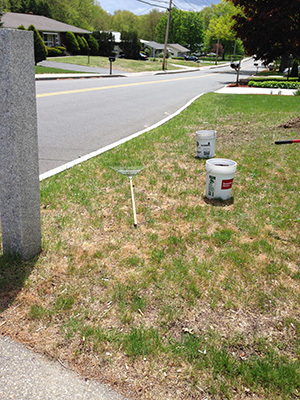 Now parts of your lawn along the roadside has an ugly orange hue. Courtesy of the salts and de-icers your local road crews used to deal with the terrible Winter conditions. This tell-tale, patchy look is a sure sign that salt from road treatments made its way on to your front lawn. Oh, and the splash effect from passing cars didn’t help either. If you live on sloped section of your street even roadside run off lent itself to the unsightly condition of your early spring lawn. The orange hue on these grass blades is actually a symptom of lawn damage from salt and de-icer products which has presented as a burnt condition on the turf. One can’t help but harken back to last summer and when your healthy lawn made you feel that all was right with the world. Well, Spring is here! 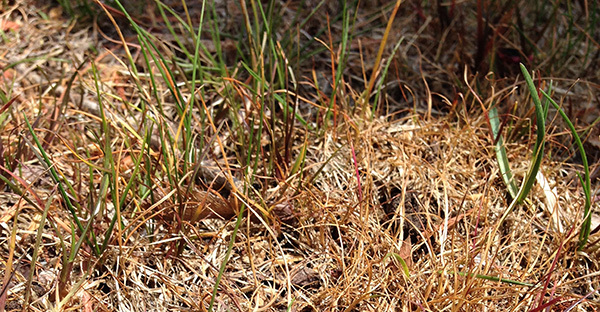 It’s time to reinvigorate your lawn, help it recover, and make Winter a cold memory. The good news is, salt damage is easily rectified by some simple organic methods and treatments that will reverse the damage and build your soil at the same time! First, you can start by flushing out the areas damaged by salt by watering them with your garden hose. Use a shower head type nozzle. These nozzles distribute the water in a natural pattern and do not use a lot of force or high pressure like some hose end nozzles which could further damage the grass. Give it a good soak down, you may need to do this a few times before the salt or de-icer is fully dissipated. Next let this area dry out before you begin raking through it, by gently raking you are trying to get up the dead and burnt grass blades in order to expose the soil underneath. Opening and exposing the soil below will ensure proper “seed to soil contact” for when we put down grass seed to reestablish turf density in these damages areas. If you already have a good quality soil* you can simply “fluff up these areas” with a garden fork or “grass stitcher” tool which will make a perfect seed bed for the new seed. *The only way to know if you have a good soil is to TEST IT! There are many good soil testing labs all over the country. Find one nearby and send your samples off to the lab. This is so important and truly the only way to care for your lawn correctly, do it the right way and test your soil! Click here is a link explaining how to take soil samples properly from A&L Eastern Laboratories. Soil testing is critical step in my Organic Start program. Putting down the proper amendments to counter act the salt damage is very important. We here at Complete Land Organics love a finished, organic, finely screened compost product. There are many on the market. In New England we have Coast of Maine, the Kidz B Kidz bagged compost made by Brick Ends Farm, and some wonderful products from The Vermont Compost Company. So, once you have let the area dry out after the initial watering work, then you have raked it of the dead and burnt grass materials its time to topdress it with your finished compost. You can put down the compost anywhere from a minimum of a 1/4” thick to a maximum of an inch thick depending on how your soil rates on the poor to good scale. Next you can broadcast some high quality grass seed over the areas and gently rake it through the compost which will blend the grass seed throughout and create the perfect seed germination bed. Make sure to water in these areas and keep them damp, but not soaked. Just remember that certain grass species are more susceptible to this salt damage. Kentucky Blue Grass is one species that is especially sensitive to rock salt and de-icers. Grass species such as perennial ryes and fescues are more tolerant to these products. When it comes time to reseed these patchy or dead areas of turf its a great idea to consider using a blend of seed species rather than a Kentucky Blue Grass sod or seed blend which has a high percentage of this type of grass seed. Now you are all set! You can be sure that your hard work will pay off and you’re now on your way to rectifying that parched, burnt, salt damaged front lawn! Don’t forget to keep up with proper watering and soon you will see a verdant green swath of lawn reappear before your eyes! Has the Siberian Express Winter left your lawn a little “salty”? Share your lawn story with me on Facebook. We are all in this together! Tired of nurturing your lawn with unorganized methods and tactics? Looking for professional help with restoring your lawn or building it to its natural best? Complete Land Organics knows what to do! START HERE. 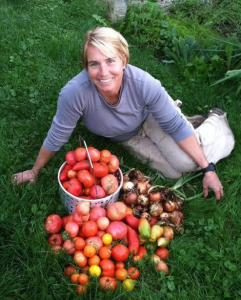 Hi I’m Britt Cooper Phillips, a Certified Organic Lawn and Land Care Professional. 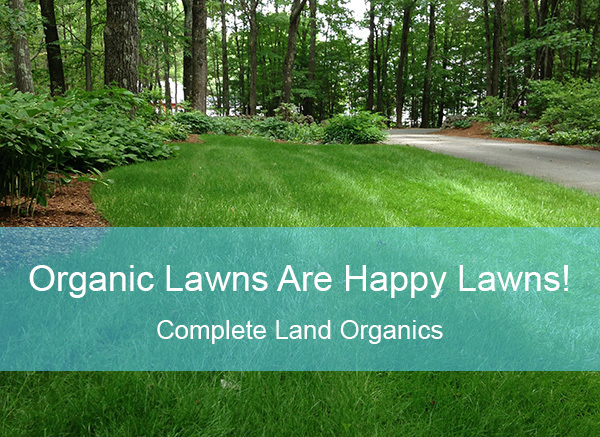 I recognized that there is a lack of resources available for home owners who want to ditch the chemicals and build a beautiful lawn naturally. That’s why I created my Organic Start program. It includes all the essentials, step by step, to build a lawn you’ll love.